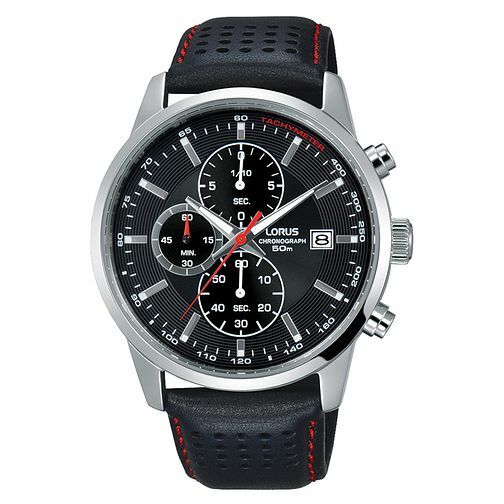 This men's chronograph stainless steel black leather strap watch from Lorus features a dark sunray black dial, silver hands and baton markers, a red second hand and a tachymeter on the outer dial. The strap has a perforated finish and red contrast stitching. The inner dials feature stopwatch minute hand, stopwatch second hand, and a stopwatch 1/10-second hand. The dial also has a date display. This watch is water resistant to 50 metres. Lorus Men's Black Dial Black Leather Strap Chronograph Watch is rated 5.0 out of 5 by 1.